The number one reason to collect Miles & More miles…. Lufthansa First Class. In case you’re not convinced yet, here are 5 reasons why you want to fly Lufthansa First Class at least once in your life. Experience DO&CO’s amazing gourmet kitchen in combination with top premium beverages, wines & champagnes at the Lufthansa First Class lounges. There’s even a dedicated terminal for Lufthansa First Class passengers in Frankfurt! After your meal you can relax at the bar or in the cigar lounge with a digestif. Don’t forget to take a refreshing bath or shower before your flight in one of the spacious bathrooms to receive a unique Lufthansa First Class rubber duck! Having a longer layover in Frankfurt or Munich? Lucky you! For just 99EUR you can enjoy a 3-hour Lufthansa First Class Porsche Excitement rental. Pick up your Porsche at the AVIS arrivals desk and drop it of at the First Class Terminal! Time to board your flight? No need to go to the gate. Your personal host will look for you in the First Class lounge and guide you to the limousine transfer desk. Your driver will ride your straight to the plane with a nice Porsche or Mercedes-Benz! With just 8 seats, the Lufthansa First Class cabin is extremely spacious and comfortable. Jetlag is for amateurs! The super wide Lufthansa First Class bed with special mattress ensure a comfortable night of sleep. The free flow of premium beverages, wines and champagne continuous onboard Lufthansa First Class. The caviar service is a must too! Lufthansa First Class for 360EUR? Buying a Lufthansa First Class ticket with cash isn’t cheap. 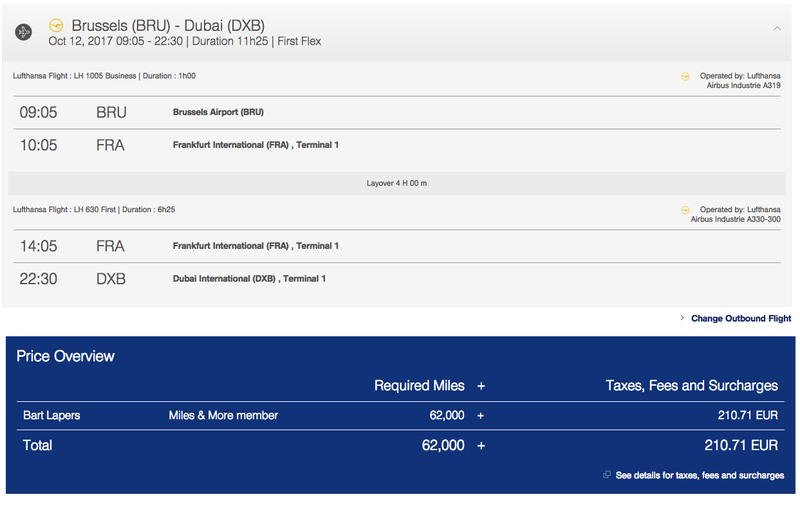 A one-way ticket from Brussels to Dubai via Frankfurt averages around 5500EUR! Fortunately there’s an alternative… book the ticket using Miles & More miles. For just 62000 Miles & More miles + 210EUR taxes & fees you can book the same Brussels to Dubai Lufthansa First Class ticket! Here’s your roadmap to collect the required 62000 miles at Miles and More. Request the Brussels Airlines Premium American Express card via my form below. Once you are approved for the card, you get 12,000 miles. (instead of the 6000 miles via the regular American Express / Miles & More website) The yearly fee of the card is 150EUR but comes with a number of travel insurances & buyer protection. You’ll earn 1.5 miles for every euro you spend with the American Express card. Check all details here. Once you are approved for the Brussels Airlines Premium American Express card, complete this form to start paying your cellphone bills with your card. You’ll get a one-time bonus of 2000 miles and earn miles for every bill you pay with your American Express card! If you request the Brussels Airlines Premium American Express card before October 15th, 2017 via the form above and spend 1500EUR with the card before the end of 2017, you’ll receive a free Brussels Airlines roundtrip ticket to a European destination of your choice in the first half of 2018! More details here. Here’s some advice to maximise the use your American Express card. Remember, you’ll earn 1.5 Miles & More miles per euro spend. Pay as much as possible with your card. Groceries, refuelling your car, bills, online purchases & subscriptions. Connect your American Express card to PayPal. If American Express is not accepted, you might be able to pay with it using PayPal. Offer family members and friends to buy things for them. They get the 90-day purchase protection which comes with your card and you’ll earn plenty of extra miles. If you manage to spend 20,000EUR in one year with the Brussels Airlines Premium American Express card, you’ll get a bonus of 10,000 miles! To earn the required 62,000 miles for your First Class award exclusively by using your Brussels Airlines American Express card, your goal should be to spend 25,000EUR in one year. That’s a lot of money, but if you are creative and consolidate some of the purchases of your friends and family, this goal might be easier to achieve than you expect. 6. Book your First Class award ticket! Thanks for your feedback Bako. Earn and burn those miles. 🙂 Enjoy your First Class ride! Can you really book a first class award with Miles and More? Only when you are a Senator I guess. I’ll try it again, And I have more miles than I can make use of! Hi Kim, yes you can. 🙂 You don’t need to have status with Miles & More to book Lufthansa First Class. Only for SWISS First Class you need Senator status. Well I just tried and only economy is offered. I tried BRU=BKK and tried BRU-CPT before. No luck. Award seats are limited. Not all flights have Business / First Class award seats. Try BRU-DXB (e.g. Oct 12, 2017) and you should see First Class award availability. 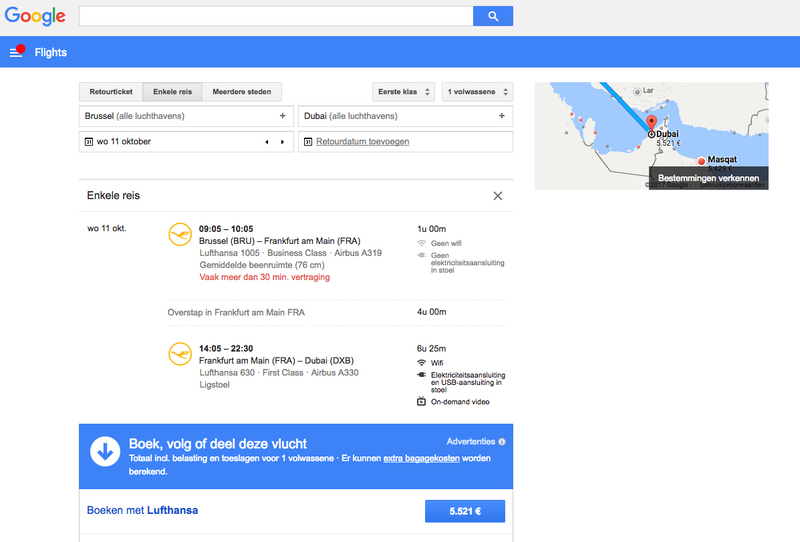 Lufthansa flights to the Middle East. Flights to other destinations require much more miles. Thanks for sharing your experience. I’ve got a business trip planned in two weeks’ time, one month in the US with massive spending which can be reimbursed… I wonder if I sign the Premium AMEX up today, will it be possible to have the card received before my departure date (I live in Antwerp, flying out from Zaventem on 29th Oct). Having checked some posts on flyertalk, I noticed that people complain about the usability of the card at initial months with occasional refusals, which ceases to take place after. Perhaps another question (thanks for taking your time to answer in advance): how does the payment settlement work? One always has to settle the payment as soon as the bill arrives? A call to AMEX answered all my questions. 🙂 Sorry to have taken up so much space here in the comment section. Thanks for your feedback Mikael! Qatar is one of my favorites too! Is the m&m site the best option for finding award space? For Lufthansa First Class it is. As Star Alliance partners only have access to the LH First Class inventory < 14 days before departure. I managed to book the A380 to Miami, looking forward to it! Great suggestion to book Lufthansa first class with 62K miles! However, this offer seems to have been expired or is very hard to get! ‘Preferred cabin’ is always unavailable, suggested alternative is business with Turkish.